End It Movement Love146 Purposed. Today is Shine A Light On Slavery day. 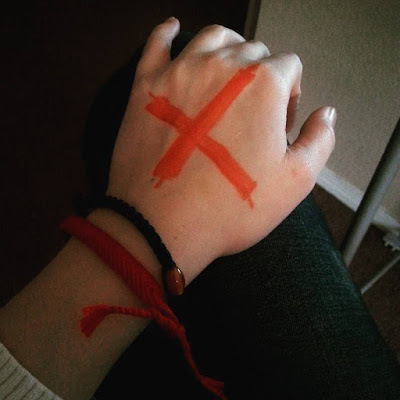 In order to raise awareness for this epidemic in our world, I've put a red X on my hand, and would encourage you to do the same and tag your picture with ‪#‎enditmovement‬. Start conversations. Scream it from the rooftops. Let's fill up the internet with X's to bring to light this abomination that's so often practiced in the shadows. Also, to highlight a few companies that are fighting back, I'm wearing bracelets from The Red Thread Movement and Tiny Hands International, as well as my hoodie from Love146 (seen here) and some handmade earrings from Purposed. Remade Creations. If you want to help, these are some amazing organizations to consider supporting. Labels: End It Movement, Love146, Purposed.